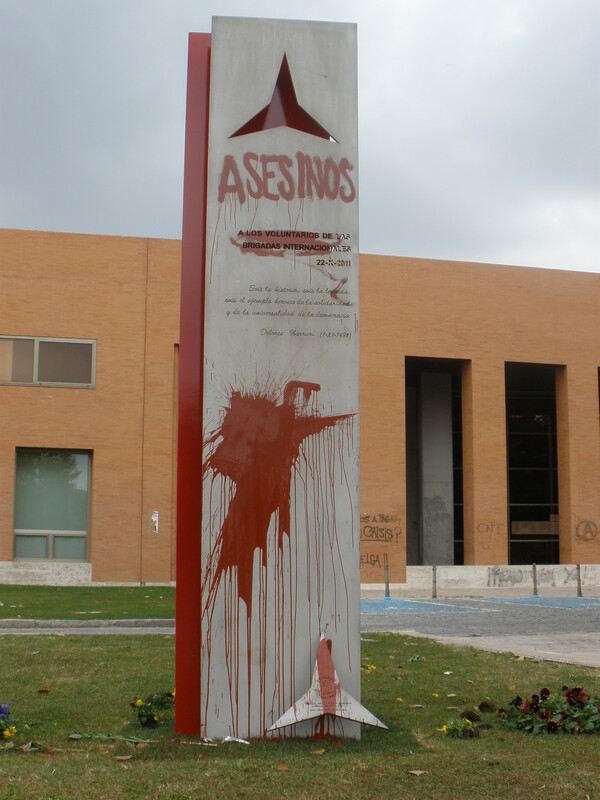 ALBA joins the international community in its denunciation of the appalling vandalization of the recently inaugurated monument to the International Brigades on the campus of the Universidad Complutense in Madrid. See El País coverage here. I live in a street named after two Fascist aviators- Franco and Jimenez in Manila. Near my place is Von Grunao street named after a Luftwaffe pilot. There should be a street that should be dedicated in memory of the Filipino volunteers who fought under the Jose Rizal Company. It is unfortunate that the majority of the Spaniards here were pro-Franco. Understandably, they were the oppressors of the brown Filipino peasants. Shame on the Spanish neo-fascists! Yague is a street in Makati City, Philippines stripped of its diaersis like another street in old Manila- Echague. It was named after one of Franco’s brutal generals who ordered, with the support of foreign legionnaires, the massacre of 4,000 unarmed peasants and workers in the town of Badajoz. The Portugese fascists sealed the fate of fleeing Spanish refugees from the beleagured town by sealing their common border with Spain. Recently, Yague’s equestrian statue was decapitated in Soria and, in Madrid, a street name that bears his name was removed. Makati has other street names: Cabanellas, Aranda, Cervera, Barron, Solchaga, Tella, Ponte, Moscardo, Davila, Mola,Primo de Rivera, Goded and Calvo Sotelo. All were butchers for the Yoke and Arrows. These sanguinary names speak of Death. They should be changed. How about artists like Picasso, Cernuda, Garcia Lorca, Miro and Buñuel who celebrated the human spirit? Or, better still, Filipino artists who fought colonial tyranny with their craft. 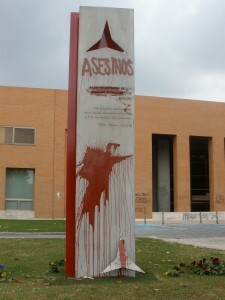 In 2010, the neo-conservatives vandalized the monument of the Filipino hero Jose Rizal in Madrid. Rizal fought the oppressive religious corporations who land grabbed peasant lands, raped our women, burned huts of poor farmers, opposed scientific inquiry and tortured with savagery people whom they perceived as subhumans. It is the same religious corporations using the cross and Franco surging with his sword that ensured Spain will remain a medieval enclave for 40 years. I am a historian based in Amsterdam looking for a person by the name of Alex Umali who published an short article on the Filipino vaudevillian Luis Borromeo in the Baguio Yearbook 2007. If you are the person I am looking for, would you be so kind to contact me? I am working on a social history of popular culture in colonial Indonesia and the Philippines. I have a special interest in Borromeo as my narrative on the Philippines is woven around this person. I would like to compare my information and the historical sources on Borromeo with that given by Umali in the article. I am also very much interested in the history of fascism in the Philippines, but that would be another, maybe future, project. I have to write a book on popular culture first. I thank you in advance and apologize for bothering you with this query. Yes, I am the person you were trying to get in touch with. I hope you visit my country in the near future. I just phoned Mr. Borromeo. I hope to hear from you the soonest. I am the person you were looking for. I wrote the article about the man who brought jazz in the the Philippines.